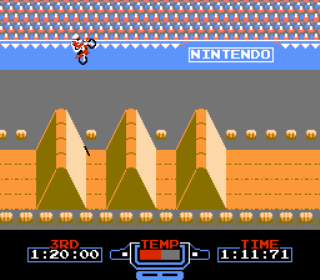 In the early days of the NES, Excitebike was *the* game to have, and it’s easy to see why. Excitebike is a dirt bike-based racing game in which you race against the clock in either a time trial format or in a group of other riders. The object of the game is to navigate your bike over and around the various obstacles without crashing or overheating to produce the fastest time possible. The most likely causes of a crash are landing with the bike nose-down and running into other riders. Your bike’s engine temperature is displayed on the bottom of the screen. Normal acceleration will cause the temp gauge to stay centered, but use of the overdrive/turbo will cause the temperature to increase. If the temp gauge reaches its maximum, the rider will pull over for several seconds while the engine cools down. Throughout the track, small arrows are featured, which when run over will cool the engine back down to normal. The game has 2 modes; A and B. Game mode A is a time trial-style race in that you are the only racer on the track. Game mode B features other riders. Although there are only 3 other riders at the starting line, there are an infinite amount of riders on the track, and you are still racing against the clock and not against the riders. Mode B introduces additional challenges in that you must avoid crashing into the other riders. The game features 5 tracks of increasing difficulty, but the real gem of this game is the track designer. The ability to create your own tracks adds infinite replayability to the game, as once you grow tired of the stock tracks you can move on to making your own and sharing them with friends. One will notice the “Save” and “Load” options in the design menu. While track designs were savable on the Japanese Famicom using a cassette recorder, saving of tracks on the US NES is not possible. The options were left in the game with possible future peripherals in mind, but the peripherals were probably never developed in the US due to the development of battery-enabled game saves. Loose or unresponsive controls can ruin a game like this, but thankfully this game does not suffer from such problems. My only gripe with this game is that it does not save your lap times, again due to the lack of a battery back-up. It certainly does nothing to take away from the game, but the addition thereof would have added to the game’s replayability. Buy Excitebike on GameGavel or Amazon. Tagged Excitebike, launch, NES, Nintendo, Racing, Review. Bookmark the permalink.